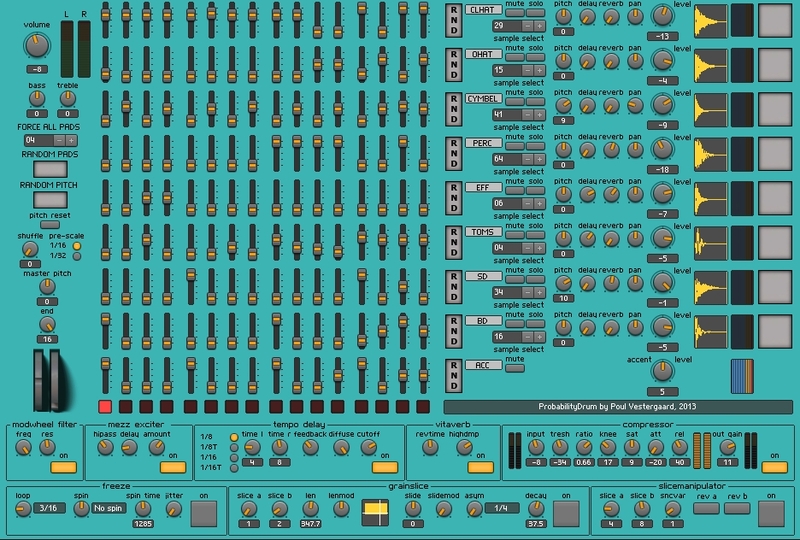 There are 8 sounds plus global accent and 16 step sequencer. Every step in the sequence has a slide for the probability for playing the sound. It has 512 audio samples 72MB. The sounds are taken from vintage synth, drumboxes and other soundsources. Enjoy... Poul Vestergaard, december 2013. 100% will play the sound every time. 0% will not play the sound. 50% will have the probability of 50% for playing the sound. probabilityDrum will receive midi note on at all 8 pads, but thats only if it's used as soundmodule. probabilityDrum will send midi notes from its rhythmgenerator. it will synchronize to midisongposition. probabilityDrum has 5 effect unit. tempo-delay, reverb, compressor, exciter and a modwheel controlled lowpass filter. pitch reset will reset pitch for all pads. each step in the sequencer has a probability slider from 0 to 1 (0-100%) in 10% steps.